In public squares across China, it is not unusual to see retirees practicing dance, tai chi, or even singing. Wang Jinxiang is no different -- except she live streams her performances to an audience of thousands online. The 62-year-old is among a legion of senior citizens trying to make a name for themselves in China's massive social media scene, a world usually populated by the young. Undeterred by the frosty winter, Wang put on a show in a square by the Bird's Nest stadium in Beijing. "Which song do you want to listen next?" she asked her 23,000 followers as she delivered an hour-long special. She began this hobby after her nephew's teacher showed her the online singing platform Quan Min Karaoke two years ago. Immediately she fell in love. "When I first started live streaming, I was faced with a lot of issues that were very troublesome. I was not that good at handling the technical things on the smartphone," she told AFP. Wang feels she has found an outlet express herself and now spends two hours every other day of the week singing and performing live fashion shows. Fans send her virtual gifts that can later be redeemed as cash of varying amounts -- China has a wealth of payment apps and social media platforms that allow people to exchange money. 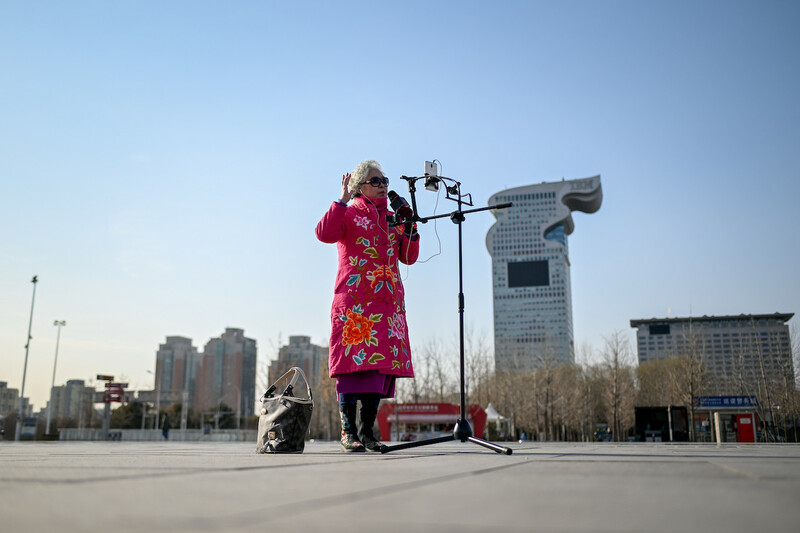 She explained: "Quan Min Karaoke allows the elderly to exercise at home, sing better and show themselves on it." "I'm constantly thinking of new things to do everyday, what new tricks I can do for tomorrow to attract and entertain everyone," Wang added. China's internet is heavily censored by the Communist Party authorities, but it nonetheless has an abundance of bloggers and vloggers. But the relative freedom of streaming content live has meant the industry is booming -- Deloitte estimated 2018 revenues at $4.4 billion, up 32 percent from 2017 -- with scores of platforms allowing people to share their skills, views, or the mundanity of ordinary life. As well as the usual beauty reviewers and aspiring comedians, live streaming can bring about unlikely stars. Last year a corn farmer from a remote cliff-top village became an online sensation by showcasing his daily activites and in 2017 an elderly couple, one of whom had Alzheimer's disease, won millions of online fans simply by answering questions from the public. In a rapidly ageing nation -- by 2050, one in three people in China, or 487 million people, will be over the age of 60, according to the official Xinhua news agency -- the internet has become a sort of fountain of youth for those who want their talents immortalised. Wang, whose main audience is aged over 60, has seen more and more older people connect with her online. "I have hope that people will be more brave. It requires us elderly people to be more active, to use our time better and have a better time," she mused before adding: "Old people should cherish and make the best of their time left." Streaming may be an enjoyable pastime for many, but the internet can still be a dark place, warned Wang Kelan, who live streams her song and dance performances from the small city of Yuncheng in Shanxi province. The 72-year-old has endured cyber-bullying from online followers who ridicule her shows. "Society is actually unfair to the elderly nowadays," said Wang Kelan, who is not related to Wang Jinxiang. "They said it was shameful to do live streaming at such an old age," she confessed, though she insisted that her love for the internet outshines the toxic comments. "Everyone says young people can't live without internet, but really, it's the same for the older generation," she explained. "I believe I live a happier and more fulfilling life than those who just gossip under the sun. I think that it is particularly boring and meaningless," she added. For Wang Jinxiang, the internet has brought her a world of possibilities: Later this year, she'll be performing live in one of Beijing's TV studios. She said: "From a young age, I loved to sing, to dance, to move. Enjoy your life and do what you want. I believe it is a happy way to spend the later part of your life."